Its interface consists of multiple screens. The biggest video screen contains the webcast of the host of the the videochat. This video window is accompanied by a chat window, that everyone that watches can use to type instant messages on. The other smaller video screens are slots for people that want to join the broadcast, by transmitting through their own webcams. 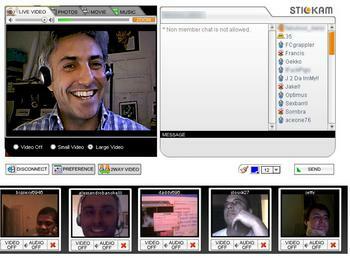 This function, to communicate through a webcam by using the Stickam player, can be used to have a private one-on-one or group video-chat with people you invite. But there is also the option to just “Go live” which makes you host a webcam transmission, open for everyone to watch and participate in. 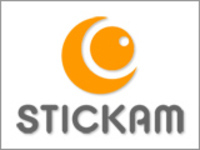 This way Stickam can be used to make an online live (24/7 if you want) webcast channel, that is accesible to everybody on the Internet. This broadcast is also open for other Stickam users who want to join broadcasting by taking one of the smaller video screens. An additional feature is that the owner of such a channel can also distribute his or hers broadcast from other web pages on the internet, just by copy pasting a HTML string into their source code. I think the merge of these two services, into one free web based application is a very interesting one. It can add a live face to face type of communication to the practises social networks are currently used for. Think about the added value of this for social network practises like meeting friends, selling/buying objects, dating, applying for a job, education, sharing knowledge, roleplaying or just to keeping in touch with friends and relatives. I can see employment recruiters using social networks to find people searching for a job and doing the job interviews live. Sellers meeting people interested in their product to give a live demonstration of the state and working of it. Amateur guitar players united in a sub community for musicians inviting each other to get a live demonstration on how to play a certain piece. This doesn’t seem to hurt the popularity of Stickam. This kind of unfiltered unmonitored space with its maybe inappropriate content, could be a selling points for the young Youtube audience that are most responsible for Stickam’s current popularity. Just like Youtube’s controversial content was one of its selling points. Besides enhancing already known web 2.0 practises Stickam’s technology brings us something I haven’t seen before. Its setup and interface, shown in the picture earlier, can result into interactive viewing spectacles or “Stickam shows”, where the lines between producer/consumer and performers/public are getting very blurry. An example is the the channel ‘karaokeking‘ where the host of the channel has his webcam and microphone pointed at a karaoke machine, so everybody can hear the music and see the lines of the text in their main screen. Then the host invites people who joined in by broadcasting themselves from one of the smaller windows to karaoke the lyrics of the songs the machine plays. At the end of the show the host gives prizes to the best performers based on the reaction of the crowd, visible in the chat screen and the other little broadcast windows. I think this shows us a preview of interactive television, we can expect to see more of in the future. Television in its traditional meaning, broadcasting distant events live on your screen. But Instead of just watching, you can be part of the audio visual content of the show through your own broadcast, while still sitting on your couch. This type of television is not about bringing a spectacle to its audience. Its about bringing its audience together on the screen, to make a spectacle. After thinking of the possibilities of this web applications, one can only become extremely disappointed, when doing a browse through stickam’s content. Most of the live ‘interactive shows’ are broadcasts of bored teenagers in their bedroom watching the computerscreen, with other bored teenagers joining in to do the same. There are some Youtube stars that use Stickam to connect with and entertain their fan base in a more personal manner. Starring in their own private reality show from their bedroom. Allot of these practises seem very time consuming, even wasting to me. People sitting in front of their computer for hours just waiting for something to happen. Teenagers broadcasting themselfs live for hours straight, not getting enough of the attention they are getting from other users that pass by to join in. There are also a couple of more professionally produced shows using a format and a certain theme to structure their show. These have interesting content, but almost never make good use of the interactive features, most even turn these off. This all is not very surprising considering how new the medium is and the type of users Stickam focuses on to get a solid user base. I have good hope this application (or similar ones in the future) will mature over time and better content will appear. Anyway an interesting and impressive web application that for now has allot of trouble living up to its true potential. Worth checking out or keeping an eye on to see how it or similar apps will evolve in the future. How to do comparative media analysis on the web: Start small.